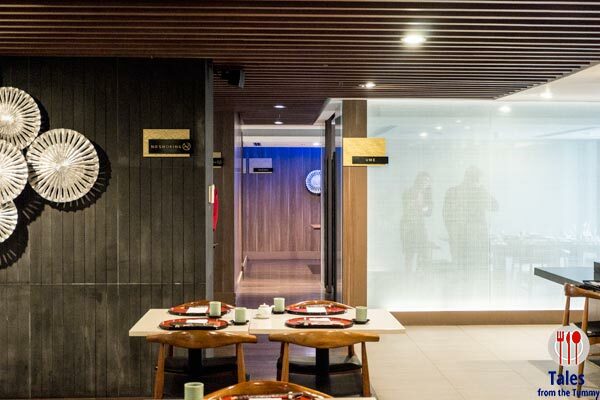 Yanagi Japanese Restaurant is located inside Midas Hotel and Casino and serves authentic Japanese dishes by chefs with many years of experience. Midas Hotel occupies the the space of the old Hyatt and you can see a remnant of the old structure encased in glass in the lobby. 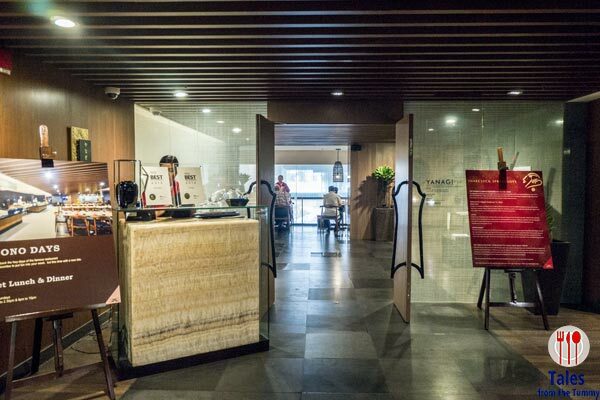 I remember Tempura Misono at Hyatt as one of the earliest and most popular Japanese restaurants in Manila. The seating area is very spacious and designed with a minimalist/zen feel to it. For a little more privacy, get their function rooms. 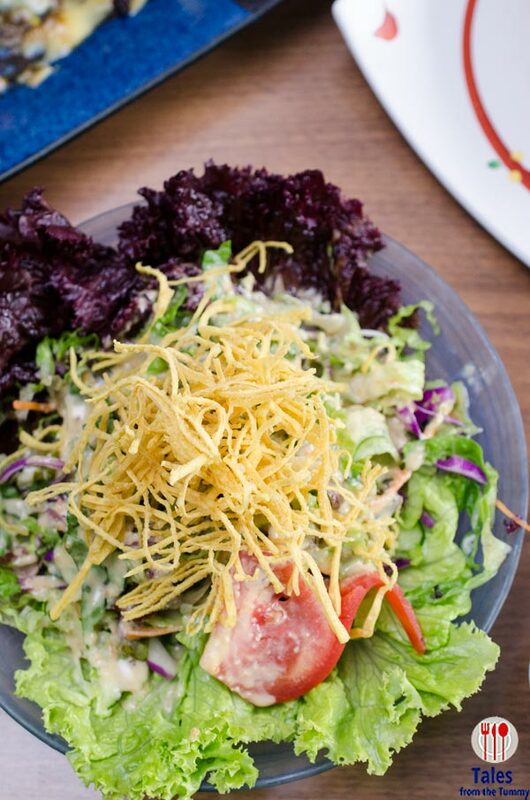 We started the lunch off with a Yanagi Salad (P295). A simple salad of mixed greens tossed with a miso dressing. This satisfied my loved for crunchy textures with the crisp toppings on the salad complemented by the creamy dressing. Aburi Sushi 5 Kinds (P610). Tuna, Salmon, Hamachi, Lapu-Lapu, and Unagi sushi are lightly burned and topped with different ebiko and fruit slices for a fun burst of color. It is then slathered with aburi sauce made from miso and soy. This was delicious, each piece had a mix of silky and interesting textures and flavors. The ebiko were especially fun as they burst in your mouths. 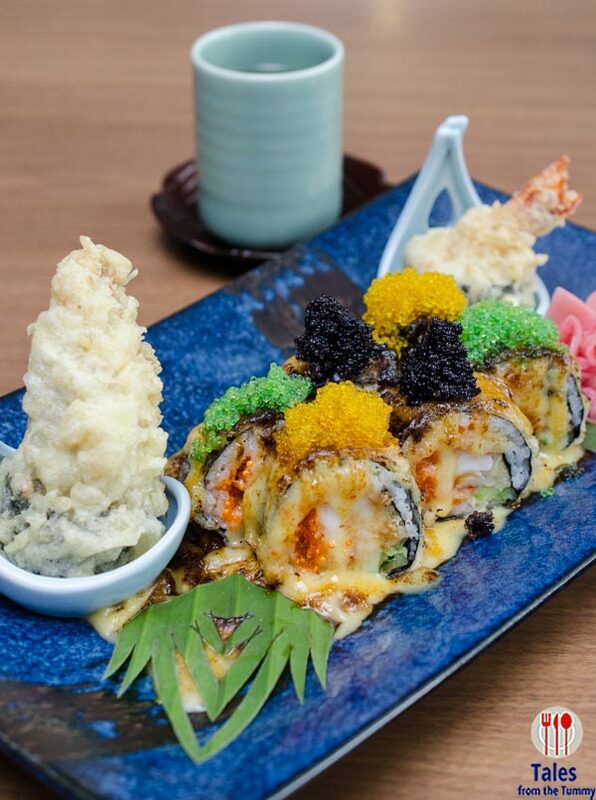 The Tempura Maki (P600) is a humongous sushi roll made with a giant prawn tempura (13-15 pcs/kilo size). 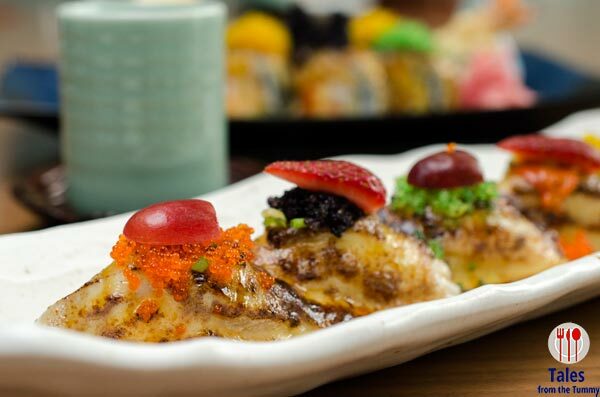 It’s topped with the same aburi sauce and different tobiko (flying fish roe). I recommend not ordering this unless there’s a couple of you to share because it is heavy and filling and of course delicious. Kaki Papaya Yaki (P500). 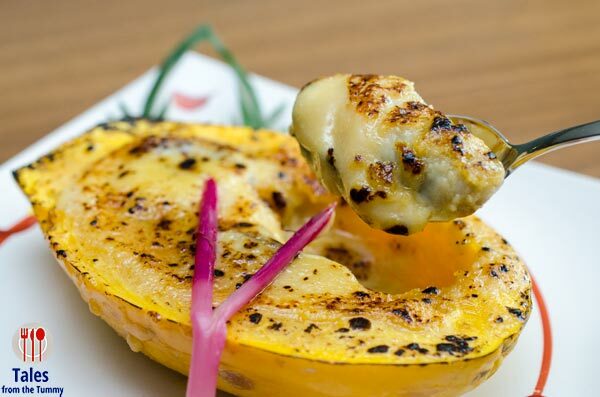 At first glance, a half papaya that’s been baked but delve further and be surprised at the grilled Japanese oysters hidden within. The oysters are baked in a mix of papaya and miso sauce. Sweet and salty and packs quite an umami flavor because of the large sized oysters. Wakadori Tatsutaage (P250). 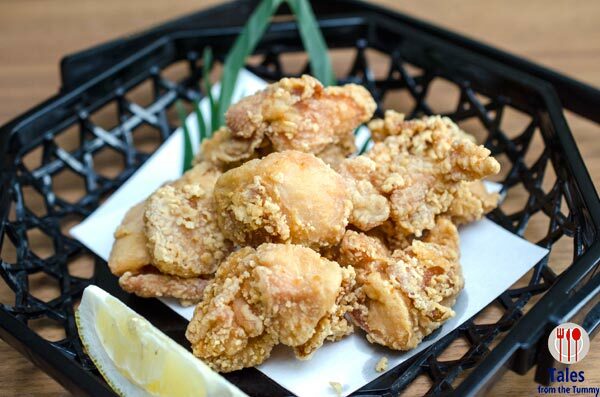 Japanese style marinated fried chicken, practically the same as Chicken Karaage. Crunchy skin but the meat could have used a bit more flavor. 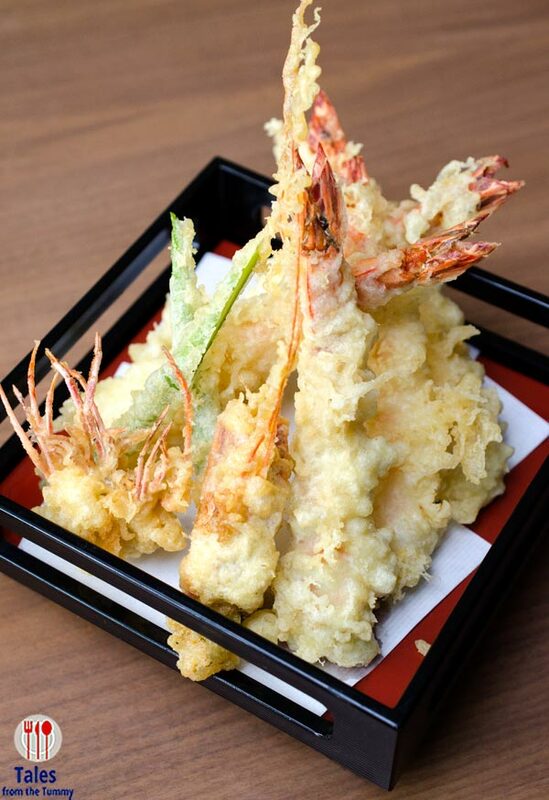 We were eating with Lauren so Ebi Tempura (P450) was a must. Beautifully arranged on a lacquer box with a crispy prawn head surprise. 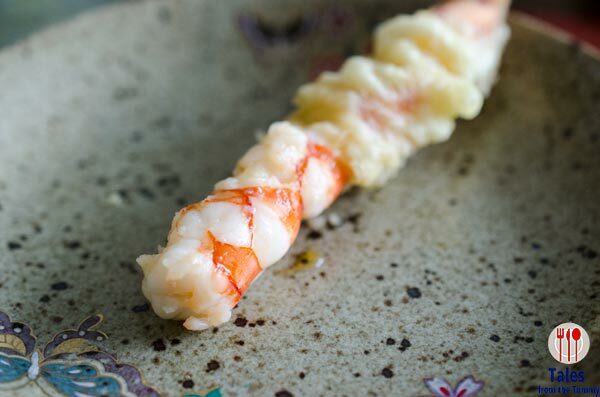 Yanagi takes tempura seriously, just look at how big and plump their prawns are. The chef does not allow pressing or pounding to make the tempura bigger and just compensate for it with lots of breading. The tasty breading is kept at a minimum so you can really taste the freshness of the prawns. One of the best tempura I’ve ever had locally. Next up were the teppanyaki dishes. 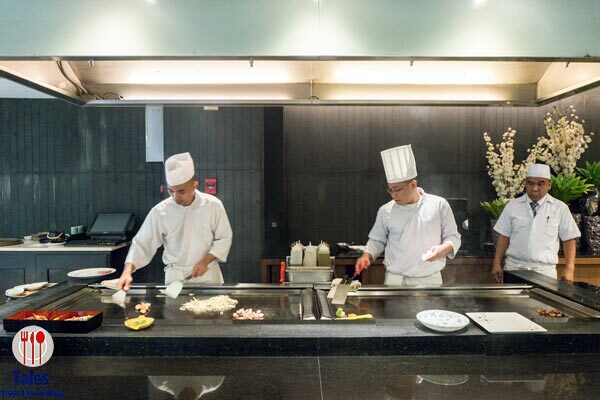 They have 2 big teppan tables where the chefs can do their thing. The first teppanyaki dish we had was the Ebi Tamago Sauce (P600). 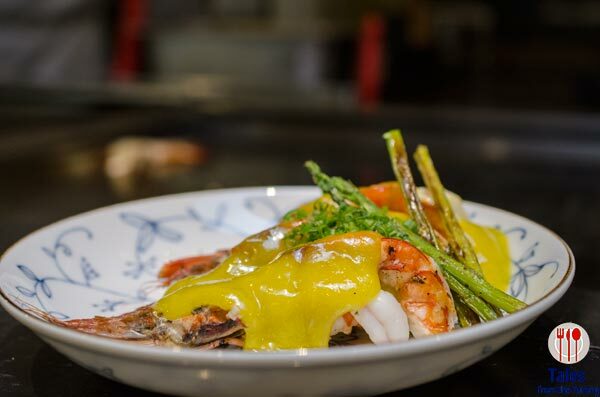 King Prawns cooked on the teppan table then topped with an egg sauce made from raw eggs and olive oil. Once the prawns are cooked, the chefs pour the egg sauce over it to heat it up for a bit. It’s great technique that they are able to keep the egg sauce at a gooey and creamy consistency. 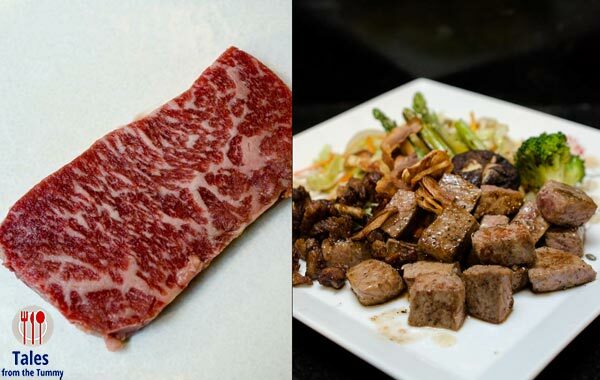 The 2nd teppanyaki dish we had was the SRF Wagyu Sirloin Steak (P2800/200 grams). Lauren was watching the deft skill of the chef, no showboating here. The chefs cooked it quickly and noting our doneness preference. We convinced Lauren to try a piece and she almost devoured the whole plate and she’s never been a fan of this before despite eating at Kimpura regularly. 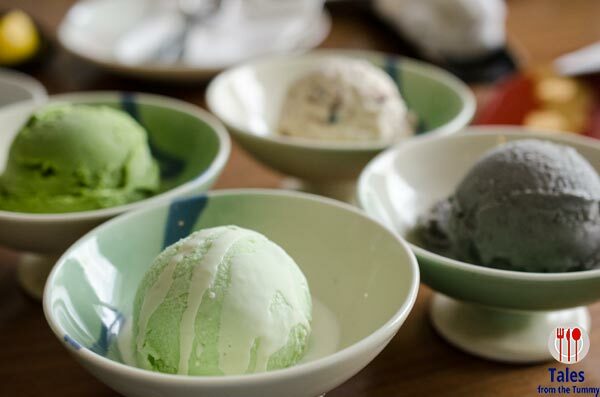 We finished our meal with their home-made ice cream in Black Sesame, Red Bean, Green Tea and WASABI (yes, no joke) flavors. I enjoyed the red bean and green tea flavors but gave the wasabi a cautious try and did not like it at all. It really tastes strongly of wasabi and was really peculiar for me. I’m happy to have found a hidden Japanese gem in Yanagi Japanese Restaurant. Ambiance is simple but the food is top notch. They serve a buffet called “Misono Days” during the weekend priced at P1,450. I’m a Ramen lover and I don’t see any pictures of it here, does it mean that Yanagi doesn’t have Ramen on their menu? Nice pictures by the way! What do you use to capture these foodporns? They probably have ramen but I’d go to the countless ramen restaurants around if you want a better bowl. Thanks, I use a Nikon D7000 for the food shots.